Singing in the Rain - 20 Great Rain Songs! When Matt Groening's "The Simpsons" reached the height of its popularity, it began to receive major competition from an other (equally famous) new cartoon series aimed at the Generation X market: that creation was the wickedly delightful "Beavis and Butthead". The man responsible for the phenomenon of the grunge-addled, self-indulgent, adolescent duo was Mike Judge (Idiocracy, Extract, Spy Kids). Judge got his start drawing insert cartoons for TV shows like the "Saturday Night Live", much like Groening did for "The Tracey Ullman Show". Thereafter, "Beavis and Butthead" developed into a popular international cult series, spawning a animated full length feature "Beavis and Butthead Do America" (which incidentally was Judge’s first full length movie) and influencing the more recent crude but hugely admired cartoon explosion headed by "South Park". Later, Mike Judge, by now a sophisticated satirist who used low humor to make high art, went to try his hand at live-action film with the side-splitting corporate comedy, "Office Space" based on his own Milton cartoon series. Though not a big hit during its time of release, this movie has slowly garnered a cult reputation primarily through word of mouth praise. "Office Space" rips into the authoritarian motifs that recur in the works of such literary greats as George Orwell and Franz Kafka: authors who paint a dreary picture of urban, working life, devoid of optimism and personal liberty. But where Kafka and Orwell focus on the nightmarish, dystopian elements, Judge focuses on the sly humor that arises out of the irrationality of the modern work place – in this case, the frenetic office of Initech, a software company where all the lead characters work. "Office Space" centres on Peter Gibbons, excellently played by Ron Livingston (Swingers, Adaptation, Cooler), a systems analyst in a prison of a dead job, who has to bear with ludicrous instructions from his managers on a daily basis, and finds little comfort in complaining to his fellow, equally annoyed, office mates. Crack-pot Milton Waddams (Stephen Root) is a mistrustful personage who is constantly moved from one work cubicle to another, eventually barricading himself off to any form of communication. And devoted slacker Michael Bolton (Mad TV’s David Herman) has to suffer the daily annoyance of telling someone new with whom he is speaking over the phone that he is simply not "that Michael Bolton!" Outside of work, Peter finds solace in the arms of girlfriend Joanna (Jennifer Aniston), an over worked waitress who has her own share of work-place insanities: she is forced to wear up to 45 badges on her uniform. An assortment of similar characters (Ajay Naidu's Samir is a stand out) complete the movie and give finishing touches to a simple story that’s essentially set inside a office but I wont spoil the plot for you further. All I can say is that Judge directs his actors like he would draw his sinful cartoons, emphasizing their reactions to create an absolutely over-the-top effect that works very well amid the ingeniously constructed workplace farce. And with the current recession, it makes a fantastic and entertainingly funny ‘office’ statement! This movie was a masterpiece of life in the 1990's. 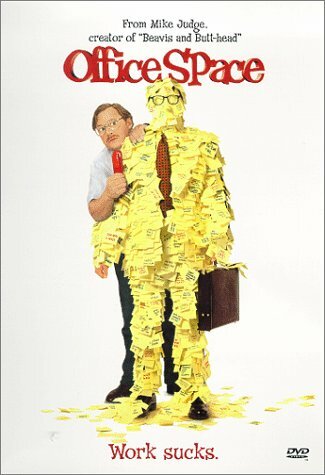 After getting my Block buster Movie pass set up, Office Space was one of the first movies that I rented just so I could watch the movie again, and I think it got better this time, although I knew every line, it was still a blast to get in the mail and enjoy a cult classic. Like the movie I had 48 hours until the DVD made it to my house, so while I waited I watched some of the 3000 movie streaming on my DISH receiver through my television.